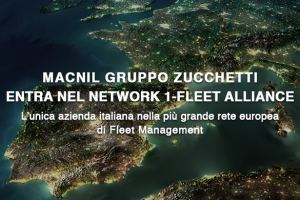 Italy joints the 1-Fleet Alliance, through Macnil Zucchetti, Fleet Management and IoT Italian leading company as well as IoT business unit within Zucchetti Group of companies. 1-Fleet Alliance is the first cooperative group in Europe for all those companies which work in Telematics and Fleet Management solutions. It counts 17 members throughout Europe. The whole Alliance controls 403 thousands GPS devices in the continent. 1-Fleet Alliance is a strategic alliance which group Pioneers company in Telematics Fleet Management in B2B segment, offering solution developed to answer the most demanding customers across all industries. declares Mr. Nicola Lavenuta , CEO of Macnil Zucchetti Group. In accord to the “Business Fleet 2016”, issued by Top Thousand, the observer on business mobility matters, 40% of big fleets on a sample of 31 thousands vehicles, already has telematics devices for remote control, particularly fuel consumption and managing crashes quickly and easily. Besides, the 15% of the sample, welcomes these tools and declares that by the year they will activate them.